As you probably already knew, this wonder of a web site received some well deserved media attention last week. Hey, we deserve it, we’re awesome! Ground lamb sausage. (I got mine from the Moscow Co-op.) Or any other type of sausage. Links would work fine too. Grated Cougar Gold sharp cheddar. A Honeycrisp apple. Thinly sliced. Cook the sausage about half-way in the pan, then add salsa to taste. Let the meat simmer until it has absorbed the salsa flavors. At the very end, put the cheese in with the meat and mix it all together. Put the meat/cheese mixture on the tortilla, and top with the apple slices. Top it with the second tortilla, and cook it on medium/high on a Griddler (or George Foreman or broil it or whatever) until it’s done. Serve with salsa, sour-cream, and apple slices. 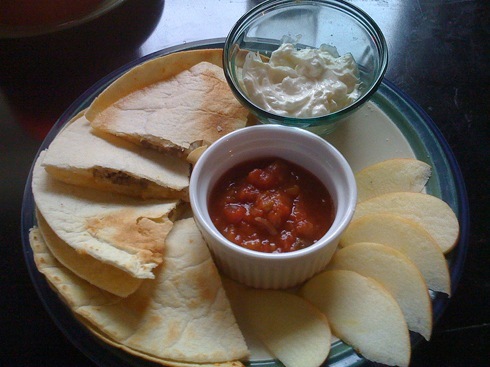 Then again, nobody really needs a recipe for a simple quesadilla, do they? Do you recommend Washington Quesadilla? Make your voice heard!